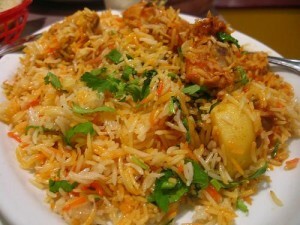 Chicken Biryani recipe by Zzz at DesiRecipes.com. Chop the onions and add oil to a cooking pot. When the oil gets a little hot add the onion and fry till it gets light brown. Then add tomatoes and the ginger garlic paste. Add coriander powder, haldi , red chili powder and salt and cook for a while. In the meantime drain out the water from the half cooked rice. Now add the chicken in the mixture. Add a little water if the mixture is dried. Cook in medium flame till the chicken gets tender and flavoured. Now take a another cooking pot and put a layer of the half cooked rice into it. then put a layer of the cooked chicken along with the sauce on top of the layer of rice. Spread another layer of rice on top of the chicken and then place another layer of chicken on top of the rice. Take half a glass of water and add 1/4 tsp of yellow food colouring into the water. Add this water in to the rice mixture and cover it. Cook till rice is cooked. in the meantime slice an onion and fry it in oil till light brown. When the rice mixture is cooked add this oil on top of the rice and cook on very low flame for another 5 minutes. Why dont you add yogurt to it? I saw some other type of biryani where yogurt was used. Instead of the yellow food dye, wouldn't it be better to add tumeric? It doesn't take that much to add a very nice yellow color. I tell you, as a girl from the U.S. Pakistani and other middle eastern cuisine seems overwhelming at times, but this recipe sounds absolutely delicious. How do you half cook the rice? are you supposed to drain the water and then add the rice?? I'm not familiar with this type of cooking... please help!!! @ sabika. it say 3-4. meaning 3 or 4.. depending on size..